On July 16, 2018, the Mat-Su Borough Planning Commission passed Resolution No. 18-22 recommended the Borough Assembly incorporate the DOT&PF Big Lake Pedestrian Improvement Study recommendations into the Borough’s Capital Improvement Program (CIP). Please join us today, April 19th, for the third open house at the Big Lake Recreation Center to review and comment on the Pedestrian Improvements Study results and recommendations. If you cannot attend the open house, the Draft Recommendations Report and its appendices are available below and on the documents page for your review and comment. Questions? Please contact a member of the project team. Please join us at the open house to review and comment on the draft study results and recommendations for improving pedestrian safety in Big Lake. This will be the final public meeting before the Study will be submitted for review by the MSB Transportation Advisory Board and Planning Commission. If you can’t make it on April 19th, please check back on this website for a copy of the draft study and send us your feedback. 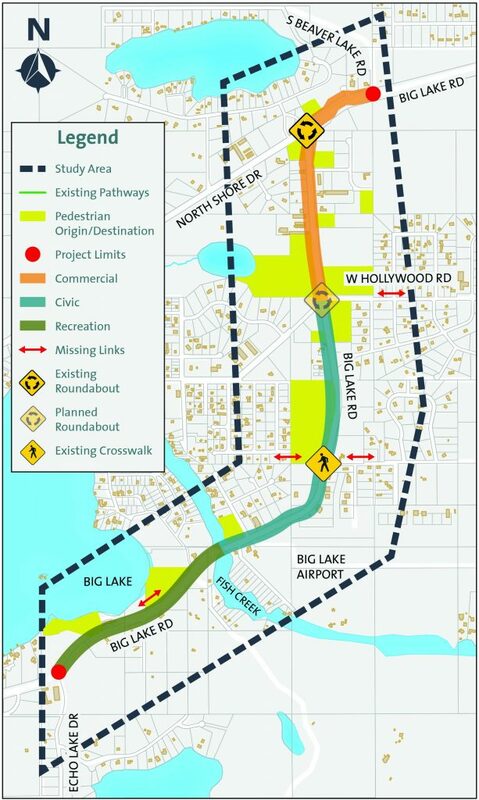 Big Lake are business owners, managers and staff are invited to join the project’s Advisory Group for a joint meeting on Thursday, April 5th, 2018 for a detailed review and discussion of the Draft Big Lake Road Pedestrian Safety Improvements Study and its recommendations. Please email Van Le, AICP at vle@rmconsult.com if you plan to attend! Please take the 10-Minute Survey on the Draft Recommendations! The Draft Recommendations for improving pedestrian and non-motorized user safety were presented on Thursday, October 12th, 2017 at the second open house. The survey questions reflect the Draft Recommendations and intends to collect feedback from Big Lake Road users and Big Lake residents. The materials presented at the open house and the Draft Recommendations are available for review here. Thank you to those who attended the second public open house to review the draft recommendations for improving pedestrian safety in Big Lake. If you missed the open house, you can review the materials that were presented below! You can still participate and provide feedback on the draft recommendations for pedestrian and non-motorized user safety on our Comment page, by contacting a member of our project team, or by using our Interactive Geographic Comment Map (click on map below to enter the Comment Map)! Join Us at Open House #2! Please join us at the open house to learn about draft recommendations for improving pedestrian safety in Big Lake. The draft recommendations will be presented at the open house and will be posted to the website after the meeting. If you can’t make it on Thursday, October 12th, please contact us to send us your feedback or leave us a comment. Kinney Engineering is out on Big Lake Road this week, April 24th – April 28th, conducting pedestrian counts between S Beaver Lake Road and Echo Lake Drive. The data collected from the pedestrian counts will provide important information on how the corridor is currently being used. If you have questions or comments about the pedestrian counts or the Pedestrian Improvement Study, please contact Van Le, AICP at vle@rmconsult.com or leave us a comment on our Comments Page. Join us at the Open House! 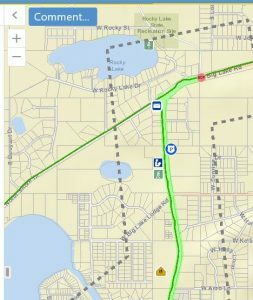 The DOT&PF is conducting a study to identify and plan for pedestrian and other non-motorized user safety on Big Lake Road. Please join us at the open house to let us know what issues you have and opportunities you see for Big Lake Road. For more information about upcoming public involvement activities, please see the Public Involvement Page. If you can’t make it to the open house or other upcoming public meetings, you can still participate and provide feedback on pedestrian and non-motorized user safety on our Comment page, or by using our Interactive Geographic Comment Map (click on map below to enter the Comment Map)!